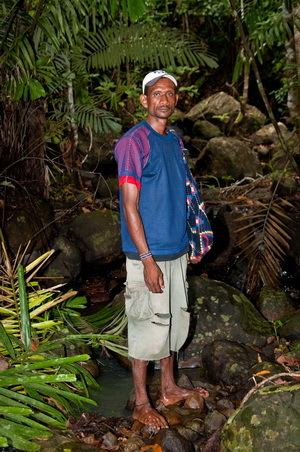 The Puri Puri men of Tufi… The path through the rain-forest was steep and still slippery from the previous nights rain. And I could sense the handful of people from the Fiyogha clan watching me closely as we made our way down to the gully towards the entrance to the secret Puri Puri place. After a wait of nearly two weeks, the previous night Simon Tewson, the manager of Tufi Dive Resort had brought me the news I had been waiting for. “You are on for tomorrow, the chiefs have agreed to let you go and Ramsi will be here at nine in the morning to take you up there”. Simon was talking about the village of Tuvirade, up in the foothills of Mount Trafalgar where the Puri Puri men live. 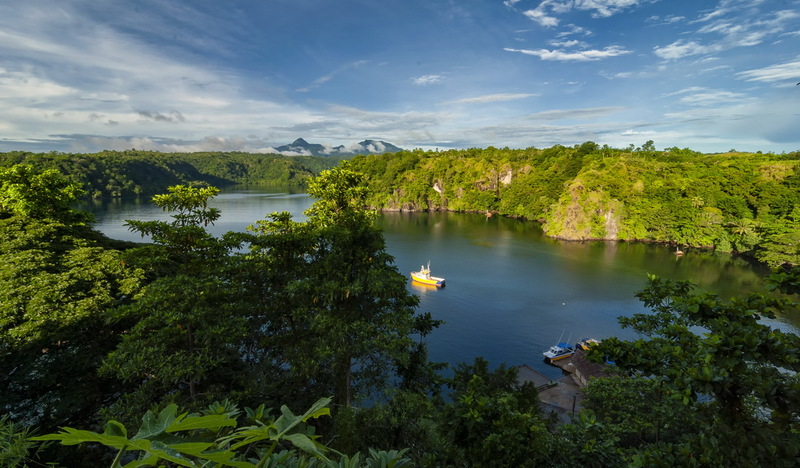 To the casual visitor to Papua New Guinea, the initial impression is typically that the country is deeply religious. Missionaries are common in the country and I have met them in even the most remote locations. Once unexpectedly about 2 hours up the Isis River on the isolated south coast of New Britain. 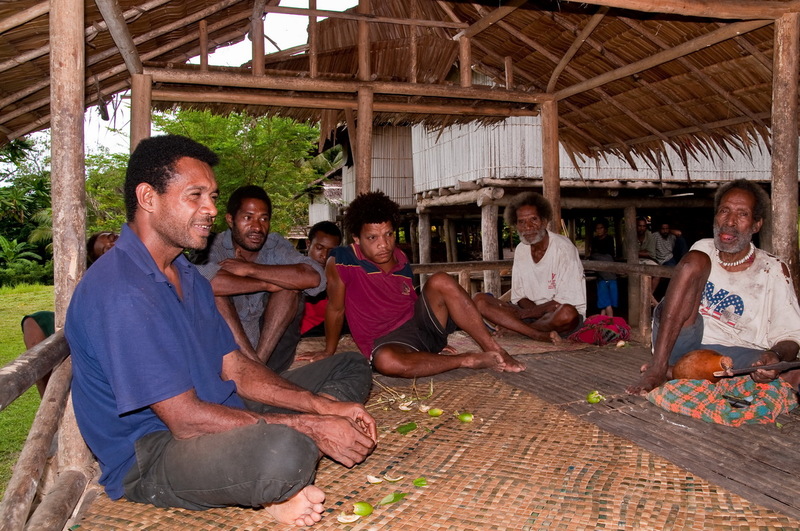 But as I gained more exposure to the local Tufi people and how they live. The more I sensed that beneath the external pious appearance was another story. One related to a belief system that time has painted over. So I turned to the various expats I knew. Starting with Simon Tewson who has spent most of his life in PNG and understands the people and their culture well. From these conversations I learned that the people who actually practice and administer the more potent elements of Puri Puri live apart from the main villages. 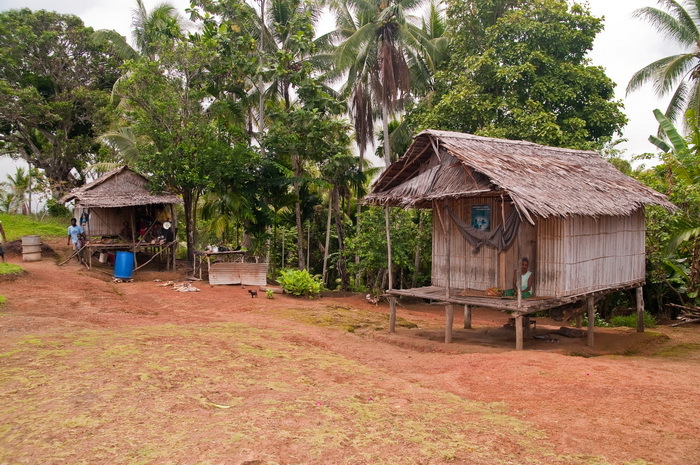 In the case of the Fiyogha clan, the Puri Puri men live in a small village called Tuvirade, further up in the foothills of Mount Trafalgar. I asked Simon if there was anyway he could arrange a visit Tuvirade. He sought the help of Ramsi Kumi, a member of the Fiyogha clan who lives in the village of Koje. Ramsi works with the resort to organize various events for tourists who want to experience village culture. 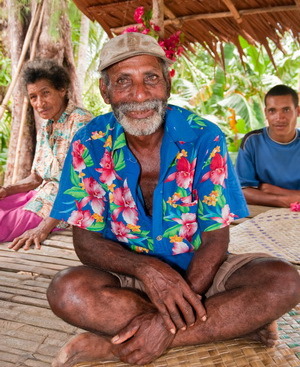 Ramsi is an articulate and clear thinker who sees tourism as the best way to help his clan and the main Cape Nelson Korafe tribe improve their lives. He has worked with the village elders to arrange elaborate sing-sings and cultural shows where special local traditions, such as Oro Province face tattooing, are demonstrated. I had attended several of these shows and found them to be well organized. And more importantly, without any hint of the circus sideshow effect that could so easily happen. 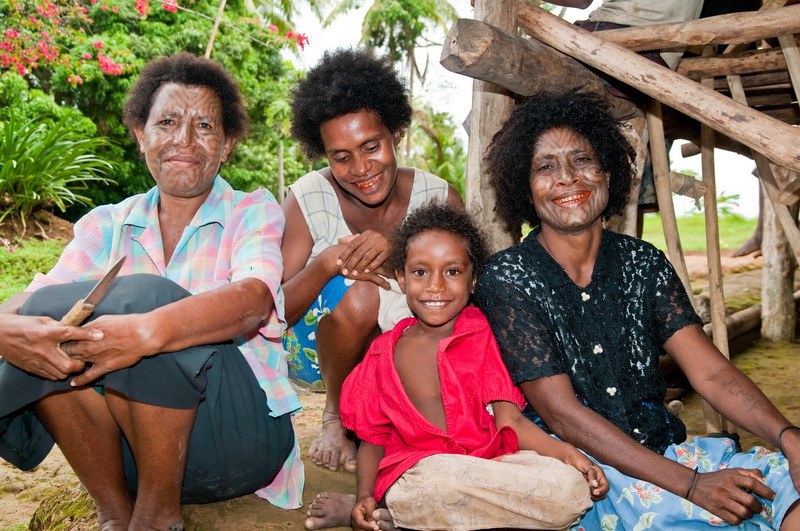 A significant benefit to the villagers is the realization that their traditional culture has a tangible value. One that tourists will pay much needed hard currency to see! But sing-sings and face tattooing demonstrations are one thing. Puri Puri is at a completely different level and to gain access to Tuvirade village it turned out that I would first need to meet the elders of the Fiyogha, Tawairi and Kandoro clans to explain my intentions. So on the last day of my first trip to Tufi, Ramsi and I made the boat trip round to MacLaren Fiord. And then hiked up to Koje for what turned out to be one of the toughest interviews I have ever had! That afternoon I sat with the elders for nearly five hours while we discussed matters from far and wide and generally got the measure of each other. I started off with an explanation of who I was. Then explained that I was interested in learning about their history, culture and tribal structure. And in particular what Puri Puri was and what role it played in their lives. In return they shared the story about how the three nomadic clans had first come to the Tufi area some six generations ago. They came in search of good land and hunting but had faced stiff resistance from the incumbent Korabi tribe. Fierce fighting was eventually followed by a peace locked in place by strategic marriages between the clans and the dominant Korafe tribe. I tried asking various questions about Puri Puri and the practitioners who occupy Tuvirade village. But that received polite and diplomatic “non-answers” and I realized that I would have to remain patient. So I decided to change tack and see if they had any questions for me. Initially I was not sure how to respond… Then it dawned on me what they were really asking was what impact of that great turmoil going on in the outside world have on the number of tourists who visit the resort. 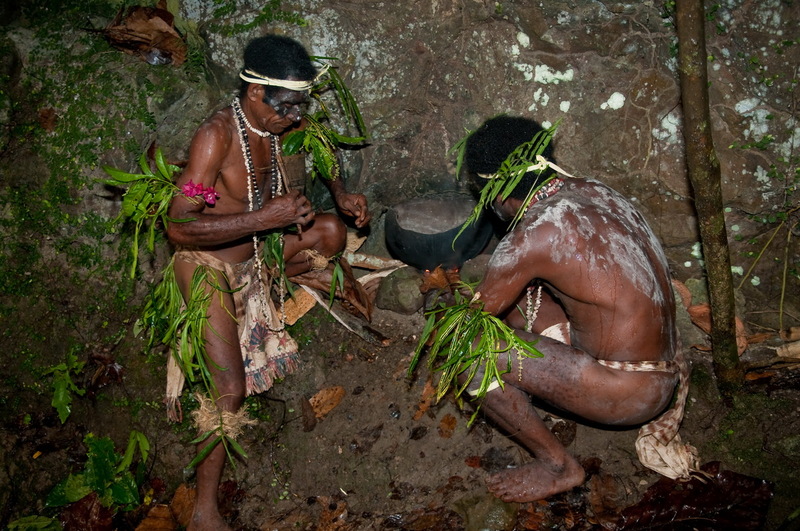 Virtually all of the villagers in the Tufi area, and about 90% of PNG as a whole, live a subsistence existence. Their local environment allows them to grow or catch more or less everything they need to eat. But “luxuries” such as school books and pencils for their children, cooking oil, kerosene and clothes can only be acquired with cash. And the only real source of cash is from the tourists who visit the resort and are interested in village culture. It was a great afternoon and one that I will always remember. But the nearest I got to the Puri Puri was a promise to seriously consider a visit to Tuvirade village if I came back to Tufi later in the year! The Puri Puri men of Tufi – The Visit! It was another 8 months before I did that and waiting for me on the tarmac was Ramsi. In the interim, and unknown to me, I had become a minor celebrity in the area when my article on homestays had been published in the Airlines PNG in-flight magazine Our Way. 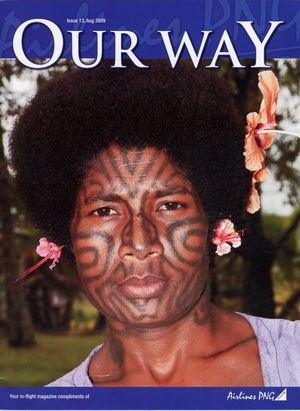 Copies of Our Way were in great demand as the lady from the Orotoaba village, who had allowed me to photograph her distinctive facial tattoos, had ended up on the front cover of the magazine. She had become the talk of the area and “world famous” in Tufi. Ramsi was keen to capitalize on this success and use it to convince the village elders to grant me access to Tuvirade. So he wanted to see if I had kept my promise to bring back certain gifts for the elders – which I had. However it still took another two weeks before the final OK was given for me visit the village. But even then I had no idea that I would be allowed to visit the “secret place” and photograph how the magic potions are prepared. I was unsure what to expect but was certainly not anticipating being greeted by an elder like Johnson Egha. Who not only spoke excellent English, but had traveled overseas to both the USA and Australia during the 18 years he had worked for the Panguna mine in Bougainville. I introduced myself and gave my standard introduction. Sensing that it was probably redundant given all the discussions about allowing me to visit Tuvirade. Nonetheless I felt it important to set the right tone prior to launching into all my questions. Over the next two hours Johnson patiently answered those questions. And then educated me about the origin of Puri Puri and it’s role in maintaining the balance of village life. Johnson explained that Puri Puri had evolved as a way of keeping order in the village. And, in the absence of a formal law and order system, its exponents basically kept “bad fellas” in check. Usually with the threat of, or if that failed, actually administering spells with the potions concocted in the secret place. Together with the traditional beliefs of leaving food, tobacco and betel nut out for the spirits of their ancestors, Puri Puri also played an important role in the lives of the villagers. However when the first Australian missionaries arrived in Tufi in the 1920’s to establish a mission station at Sefoa, their steel tools and axes, kerosene for lighting and soap for washing greatly impressed the Korafe. This modern technology was the catalyst the missionaries needed to convince the local people to embrace Christianity and abandon their previous ways. Basically the villagers believed that somehow the missionaries had more powerful “magic” and so Christianity was the way to go! Over the intervening years Puri Puri has gone from being almost wiped out after the arrival of the missionaries. To reaching an all-time high again in 1990’s, when over a 100 people are rumored to have died from poisoning. So bad was the situation that the villagers rose up and forced the Puri Puri men to stop. I had heard that the Puri Puri men administer their spells and potions by chewing certain secret ingredients from the sea and the rainforest with their betel nut and then blowing out the concoction from their mouths in a kind of mist. So it’s a logical step to go to the Puri Puri man for treatment which comprises of certain secret ingredients chewed with betel nut and then “blown” onto the affected area. Alternatively if somebody is planning a long journey by canoe they will go and see the weather Puri Puri man and request good conditions for the required time. This is usually obtained by a betel nut based spell being blown on a coconut containing water that is kept undisturbed in a special place for the required time. The third level is very secret and specialized, only done by the elders in the Puri Puri villages such as Tuvirade and is focused in two areas – advanced medical problems and dealing with “bad fellas” who are causing problems in the village. Johnson explained that for the medical problems there is a kind of network in the Tufi area so “specialists” in specific illnesses and problems can be consulted and brought in as required to heal or counteract a spell or a poison. The other side of this is that the Puri Puri elders can also induce illness and even death if necessary to deal with people who are causing problems. These illnesses vary in length, depending on the severity of the problems, and these days only result in death in the most extreme cases as the induced illness is usually enough to straighten out trouble-makers. I listened intently to Johnson as he explained all this to me. Pausing occasionally to double-check points in my notes with him to ensure I had got it right. It was quite an overwhelming experience, because to my western educated mind none of what he told me made any sense. But there was no doubt that everybody present believed completely in what he had said. So when he told me that the elders had decided that I should be allowed to visit the secret place in the rainforest where all the potions were prepared I felt a mixture of excitement at being the first white fella to do so, laced in with just a touch of fear about what I was about to do. It took about 30 minutes to get to the bottom of the steep gulley that lead to the secret place, and once there I paused for a minute to take a few quick photographs of the location, and some of my guides, before starting the rock-hop up the stream. About 50m up the stream I caught sight of the first Puri Puri guard, almost invisible in the rainforest in his traditional dress and body and face paint. Then I saw the other two guards whose job is to make sure nobody comes close to the secret place. A call was issued and Ramsi said it was the all clear to proceed. 10 minutes later I was face to face with the village’s two main Puri Puri men as they stood in front of the clay pot used to make their potions in. It was an eerie experience, made considerably so by the fact that almost as soon as I arrived the skies opened and it poured with torrential rain! Throughout the process the Puri Puri men wear a ginger-like root around their neck. Constantly chewing from it and then “blowing” the juices onto their hands and arms to protect themselves from the effects of the potions they are preparing. When all the potions were completed and stored in the pouch the head Puri Puri man gave Ramsi a nod. This was the sign that my time in the secret place was up and it was time to leave. The walk back out of the rainforest took longer because of the heavy rain that was still falling. But when we got back to Tuvirade the elders were waiting for us… Then it was my turn to answer questions as they asked about my understanding of what I had seen. Finally after about an hour I thanked them all profusely for allowing me to witness and photograph such a unique event and bade them farewell as we made our way back to the dive resort.